Nothing says summer casual like a pastel sundress. With two weddings, two birthday bashes and a baby shower on the horizon I've been saying "yes" to almost every dress that's been catching my eye! Since my summer wardrobe is already sprinkled with pastel hues it makes styling dresses in the similar palette a cinch. 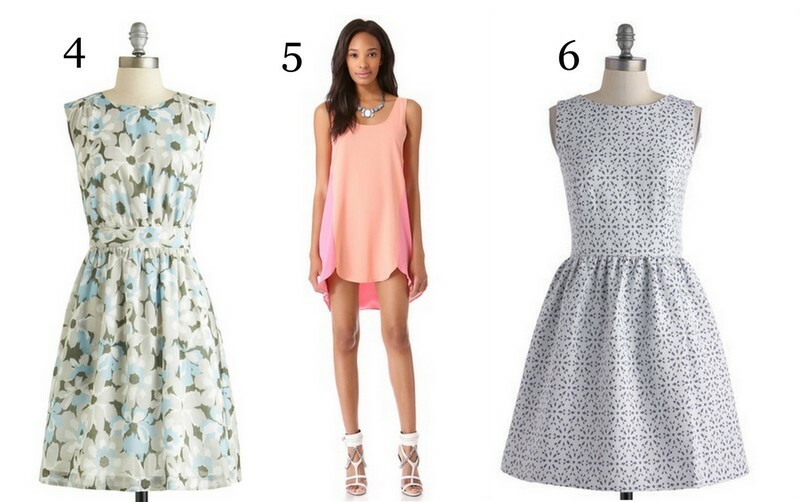 Below are some of my favorite pastel frocks that are currently available. Hi! Just found your blog and I think you're great!! Love your style and this outfit is fabulous! Love the manicure. You look very pretty! Great dress and shoes! Stunning! Your hair always looks so flawless. Nice summery pastel colours, you look great! Nice dress :) I love pastel colors!! Great jacket and great heels! Today I show you a Total White look during my holidays.....and a New Pair of amazing Pumps!!!. In love with these pretty dress. The whole outfit looks so beautiful. wow you're so cute!! love these colors!!! You are adorable! I love the way you put these pastels all together. Love the yellow jean jacket. BCBG is the best. such a cute dress! i'm also obsessed with your nails! Super super super cute dress!! Love a great dress for summer...perfect picks! Love that yellow jacket! and love number 5 dress! I'm loving the yellow and blue together! amazing pastel combination, so pretty! Adore the dress, pastel blue is so cute on you, plus it looks lovely with yellow! Looks like you have a busy summer girl! The print of that dress is so cute, can't believe it's so from Kohls! Love this outfit. The blue dress is so pretty-love the print. The pastel mixing was done beautifully! Love this dress with the yellow jacket. Such an adorable outfit, love the colors together! I love those heels...super cute! Beautiful and so feminine. You shoes are amazing. Darling summer style my dear!! LOVE that yellow jacket...so cute! Stunning as always! This dress is absolutely adorable and I love the color combo with the jacket! This is so cute! I love the yellow jacket. And your nails look great. Love this look! The pale yellow jacket is so pretty with that dress- adorable! This location and outfit is stunning. Loving this sundress and jacket together! Darling outfit! Love the blue and yellow color combination. Very Summery! Chic chic. This would be great for a bridal or baby shower. You look great with that dress and that yellow denim ties the outfit together. I love all the dresses, especially #'s 1 and 5. I need that dress and jacket. Summer sundress is perfect!! I like number 5! How cute are you! I love your dress and the added color from the jacket!! Have fun at all of your upcoming events!! You look adorable! I'm loving this pastel look. blue and yellow is such a lovely combo!! This combination is sweet and suits you well! TOTALLY IN LOVE WITH THE ENTIRE OUTFIT. VERY FUN AND SUMMERY AND THE POLKA DOT DRESS IS TO DIE FOR. Love this outfit! Check out my blog? Im new. You always have the best taste in dress, Anna. I love that none of these pieces are too expensive. Gorgeous look ! You look stunning doll. Wow, I love this yellow jacket. And the dress is too cute. You always look so cute! I love looking at your pictures! That dress is adorable! I love the yellow - the perfect touch! What a great girly look! Gorgeous look! You look stunning.